Trout fishing in Arizona is only picking up with monsoon activity. Many high country fisheries are scheduled to be stocked this week. But first some great news from Patagonia Lake! We have successfully excavated a channel to deeper water and the lake caught significant water overnight. It is currently about 22 inches down from the normal high water level, and all boats should be able to launch with no problem. We don't anticipate any issues for the main boat ramp for the remainder of 2013. On a quick stocking note, this week the Tonto Creek Hatchery is dumping fish into Tonto Creek, Haigler Creek, Christopher Creek, East Verde River and Woods Canyon Lake. Unfortunately, all lands that are owned or managed by the state, including Department wildlife area, remain under stage II fire restrictions. One thing this means is no campfires. We sure could use some more heavy monsoon rains. As far as this writer's concerned, there's nothing like a campfire for good story-telling, fresh-cooked trout and even dodging those plumes of smoke. For further information about fire restrictions on public lands in Arizona and New Mexico, call toll free 1-877-864-6985 or visit http://gacc.nifc.gov/swcc/. 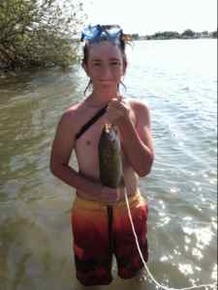 And how about this feat from a young, precocious angler: On July 5 at Parker Strip on the Colorado River, this young man, see Photo #1 was catching and using crawdad, goggles and all, eventually landing this 14-inch smallmouth bass. 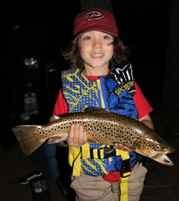 Good to see enthusiastic young anglers. Remember that at Blue Ridge (C.C. Cragin) there is no bag or possession limit. The road is open and SRP has begun to draw the lake down for necessary repairs to the dam and associated piping. There have been reports of some nice holdover trout being caught. The lake will not be stocked this year due to plans to drain the lake for repairs. Angler's reports that have been emailed to BFishing@AZGFD.gov have been pouring in. At Willow Springs, one angler (see Todd B. 's angler's report) had a great tip for anglers: he noticed that too many anglers last weekend were trolling too fast, which was keeping their rig too high in the water column. Great tip, Todd, and thanks. Also, if you have any questions in regards to fishing, send your question to the same address, BFishing@AZGFD.gov, and we might feature your question, and our answer, in the "Q & A" section. Regardless, we will answer your question. Finally, something to note: Frances Short Pond suffered a partial fish kill over the weekend. Arizona Game and Fish Department interns noticed dead fish on Sunday, July 7. The partial kill included catfish, bluegill, bass, and trout. Some catfish were observed alive surfacing. Many dead fish were cleaned up.